Our original church Old Saint Paul Church in downtown New Bern, NC suffered hurricane damage from wind & rain but escaped the storm surge. 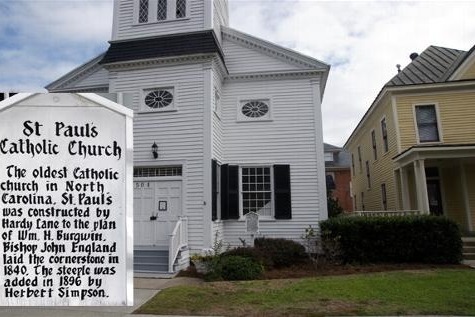 Old Saint Paul is the first Catholic Church in North Carolina. It was built in 1840-1841 and is a Greek Revival rectangular frame structure three bays wide and four bays deep covered by a gable roof. It features a central square projecting entrance tower, added in 1896. It was listed on the National Register of Historic Places in 1972. Mass is still celebrated here every Friday morning. We are hoping to raise money to do the necessary repairs to keep this historic church fully operational and a living part of the community of New Bern. If you would rather have your donation go to the general Hurricane Florence relief effort for the City of New Bern we will forward your donation to the appropriate parties.